Listen to "Chappaquiddick: Power, Privilege, and the Ted Kennedy Cover-Up" on your iOS and Android device. A young woman leaves a party with a wealthy US senator. The next morning her body is discovered in his car at the bottom of a pond.This is the damning true story of the death of campaign strategist Mary Jo Kopechne at Chappaquiddick and of the senator-a thirty-seven-year-old Senator Ted Kennedy-who left her trapped underwater while he returned to his hotel, slept, and made phone calls to associates. It is the story of a powerful, privileged American man who was able to treat a woman's life as disposable without facing real consequences. 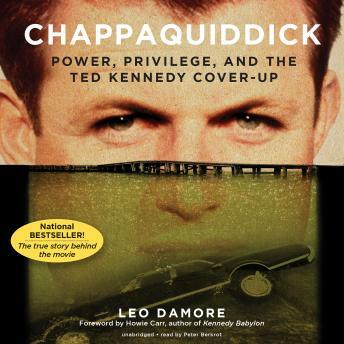 And it is the story of a shameful political cover-up involving one of the nation's most well-connected families and its network of lawyers, public relations people, and friends who ensured Ted Kennedy remained a respected member of the Senate for forty more years.Leo Damore's 1988 national bestseller, originally entitled Senatorial Privilege, almost didn't make it into print after its original publisher, Random House, judged it too explosive and backed out of its contract with Damore. Mysteriously, none of the other big New York publishers picked it up. Only when small independent publisher Regnery obtained the manuscript was the book's publication made possible and the true story of the so-called "Chappaquiddick incident" finally told. This thirtiethth anniversary edition of Senatorial Privilege is being released to coincide with the nationwide theatrical release of the movie Chappaquiddick starring Jason Clarke, Kate Mara, Ed Helms, Bruce Dern, and Jim Gaffigan. Thoroughly interesting read about a subject that caught my attention as a young woman in Australia, quite besotted by the Kennedy Camelot myth, the assassinations and the Kennedy family in general. It answered a lot of questions I have had for years. Extremely well narrated. Thank you.